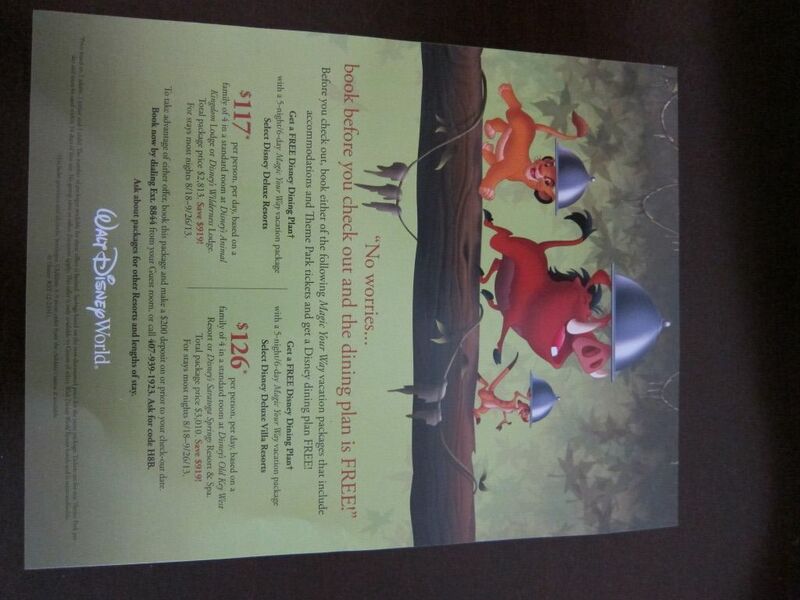 Does anyone know if they are going to offer the Free Dining Plan for September 2013? We are trying to plan our trip and we want to stay at a villa but can't afford it without the free dining plan. Any details available yet? No details, but the fall free dining promotion usually isn't announced until the spring so it may be a while until those details are released. Lots of pixie dust for FD for you! I don't know....but really wishing you get it! thanks, wiigirl and tinkerbell! sure do hope we get sprinkled with lots of pixie dust! CM's were blocked out of using their 20% dining discount as well as not being able to use our Holiday Celebration dining discount coupons last month. The same block outs apply for September, 2013. That's a pretty good indication there will be free dining plans again in Sept., 2013. Oh you are awesome! That makes me feel better. I know they told me if we booked now and they offer it they will reimburse us for the money if its paid or take it off our balance. So that is reassuring! It is possible. When I stayed in fall of 2012, the bounceback offer had free dining for fall of 2013. That is true if you book a package deal, however there if free dining is offered then only a limited number of rooms per resort will be open to the promotion. In order to get the code, you may have to switch resorts. This happened to us last year. We were booked at Pop and the FD code was released. Our travel agent tried to apply the code to our current reservation, but the only value resort opening with FD was All Star Sports. We ended up deciding to upgrade to a moderate. All of the money we paid on the original Pop reservation was transferred to our CSR reservation. You may be able to keep a reservation you make now and add the free dining code, but be aware that you may have to change resorts if the resort where you are booked does not have rooms available for free dining during your travel dates. We are planning on booking a villa so I hope if we do it soon that it will ensure us one of the rooms that are allotted for the free dining plan. Does anyone know how this affects the villas? I figure they are probably fewer available than just regular rooms. We got it on our bounceback we just booked for Sept 2013. Hopefully that means they will open it up to the masses after the first of the year. Hope ya get it! Actually, yesterday I received a snail mail pin code. Two options: resort discount or free dining. Dates from what I remember were jan.-feb., march through may 22nd, and then the dates jumped to aug. through sept. So look out, you never know what you'll find in your mail box one day-- unfortunately, we go end of may, beginning of june so the dates weren't good for us. I got a PIN in the mail on Monday for Free Dining in Jan-Feb or Aug-Sept.. you could either choose FD or 35% off select resorts for those dates. I was shocked to see a PIN for Sept 2013 already! I won't be using that though since I am going in November next year. See I got the pin for that via email a couple of weeks back and we plan on using the 35% off on a villa. Will they let you use a free dining plan if its announced in the spring as well? If you are wanting it, so that you can use it, those Pins are connected to the name and address on them only and they can not be shared. If the pin came with my moms name on it and she wasn't going but I wanted to, I wouldn't even be able to use it because she needs to be on the reservation. Maybe you will get one! Good luck! No, you can only use one promotion on your reservation, so it is either or.